Puppies born with low birth weight are more likely to die in infancy than those of normal weight. According to a French study presented at the 7th International Symposium on Canine and Feline Reproduction in 2012, the rate of death in low-birth-weight puppies was 3.8 percent higher between birth and age 3 weeks than in other puppies. More than other factor, breed affects birth weight. A large dog gives birth to larger puppies than a small-breed dog. As the veterinary website DVM360.com points out, the average Pomeranian puppy weighs 4.2 ounces at birth, while a Great Dane puppy weigh 22 ounces. Puppies are considered to have low birth weight if they are in the 10 percent of newborns with the lowest birth weight measured in their breed, according to the French study. 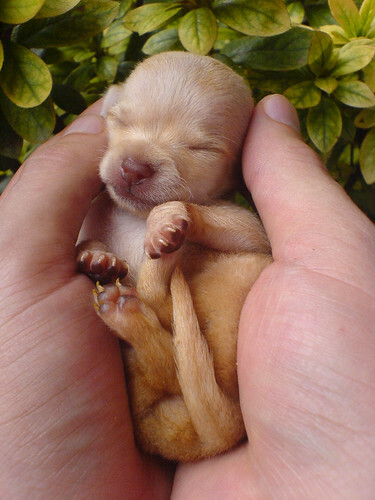 Whatever the breed, the birth weight should double within 10 days in healthy puppies. That holds true whether the puppies were born at an average or low weight. Puppies should gain about 10 percent of their birth weight daily during those first 10 days. If you decide to breed your dog, provide her with the best nutrition and proper veterinary care during her two-month gestation. Pregnancy demands a lot of any dog, as her body diverts nutrients to her fetuses. A malnourished or sick pregnant dog's body will still send precious nutrients to the developing puppies, but her poor resulting nutrition will affect the puppies' birth weights. Feed a pregnant dog puppy food or high-energy food, and more of it than you normally feed her, until she weans the pups. Low-birth-weight newborns often suffer from potentially fatal low blood sugar, or transient juvenile hypoglycemia. Low-birth-weight toy breeds are at higher risk. Symptoms include failure to nurse, weakness and seizures. In an emergency, you can put a little corn syrup in the puppy's mouth -- but get him to the vet at once. Fading puppy syndrome, or failure to thrive, also affects low-birth-weight puppies more frequently. Healthy newborn puppies pretty much nurse and sleep. If you notice a puppy who doesn't nurse, cries a lot and stays away from his siblings, take him to the vet immediately. Most litters have a runt, a puppy considerably smaller than his brothers and sisters. Because of his smaller size, the runt often suffers from health issues his siblings don't. That doesn't mean a runt can't grow up to be a healthy canine, but he might require some extra care and attention -- definitely so if his mother rejects him. The runt's position in the womb affects his low birth weight. In utero, the runt doesn't get as much nourishment because he develops in the middle of the mother's Y-shaped womb, further away from mama's blood supply than the other puppies. VCA Animal Hospitals: Did You Bring Home the Runt of the Litter?